Getzen have upgraded their 916 piccolo and added it to theoir custom series line with this 3916 piccolo. An all new 4 inch bell, redesigned mouthpipe and tuning configuration, including changing the reciever to take standard trumpet mouthpieces and a brand new mouthpipe tube. 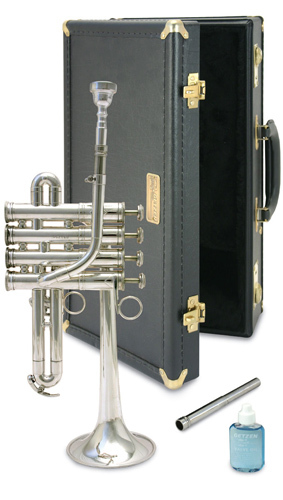 The biggest improvement is the redisigned valve block, keeping the excellent valve action and durability Getzen is renowned for the world over, the overall layout has been changed to make the instrument freer blowing with excellent intonation. This instrument is exclusively produced in the Getzen ProShop and has become the tool of choice for baroque and speciality players.